Hello everyone. I've been a bit flooded of late so blog posts have been sparse. In the beginning of the month, I published a collection of images from my 2014 "photographic year". Though I always do this and view it as a useful way to assess my growth and artistic voice, I purposefully posted only images taken at 100mm focal length or less. You can read the entire post HERE. The image I am sharing today NEARLY made the cut in that post. 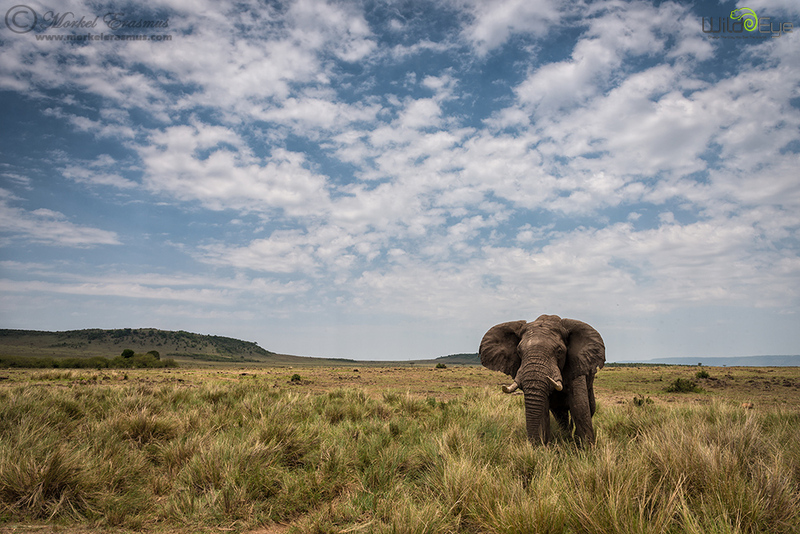 During our +Wild Eye photographic safari to experience the Great Migration in the Mara Triangle in September 2014, we spent some time with a gentle yet impressive African Elephant bull who was leisurely grazing on the long red oat grass along the Mara river. He was right next to our vehicle so I was able to inspire my guests to really work the scene with their wide angle lenses. I am a sucker for an "animalscape" and having a circular polariser in front of my lens helped bring out more detail in the sky and tame some of the harsh late morning light. Do you enjoy seeing photos like this? Or do you prefer the animal to be larger in the frame? I love the animalscapes! Tighter portraits are fine too of course, but I come away from a lot of wildlife photography wishing I had more sense of what Africa actually looks like. Please keep them coming! I much prefer wildlife imagery that includes at least some sense of the environment. I also like the wider perspective shot including the wildlife and environment. I must admit that I like close-ups of the animals, as well. Perhaps for some really cool animal pics that you could do both provide both wide and close-up shots? The hard part will likely be determining which of your shots warrant this special treatment, as likely they are all cool!